With everything going on around here in January, I didn't watch a single CHA video showing the new products. 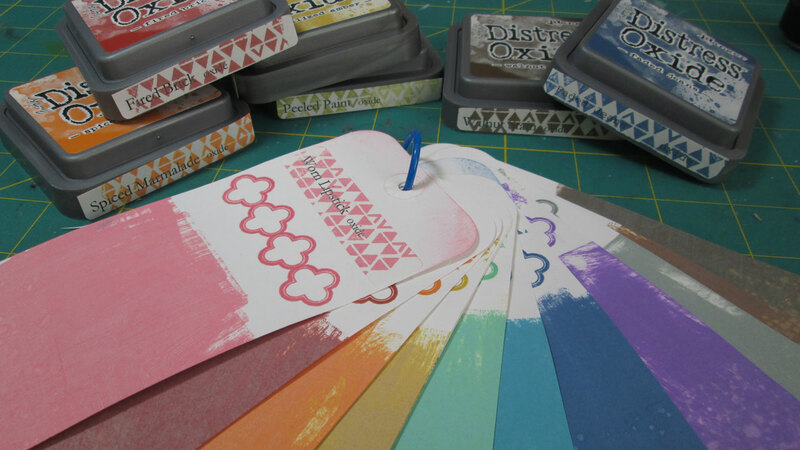 So I'd never heard of Distress Oxide inks until I saw them pop up on my Instagram feed as fellow crafters began getting them in. So I went to check them out watching videos from Jennifer McGuire and Tim Holtz. These inks can do almost everything you would want in an ink - all from a single pad so I just had to have them. and of course, Distress edges. As a bonus, I only had a couple of these colors in regular Distress Inks so I got lots of new colors buying the set. After getting them, I did a color palette to be able to easily choose the right color for a projects and see how each color works with its different features. I had already been thinking that I needed to use my stamps and inks more this year as they are my single biggest investment in my craft room. Now I really want to use them more! So cool! I just bought the whole set too!!! Can't wait to play with them. Let's hope that Tim will do another Creative Chemistry class soon!! Hope you enjoy your new inks!